I am a cartoonist and amateur gamedev. This is a simple 1 screen game inspired by the classic game POOYAN. Shoot the balloons to knock your enemies down from the sky before they can land on the ground to steal your gold and ultimately invade your cave. Press Z to shoot, and use up/down keys to move up and down. here's the original 30fps version. 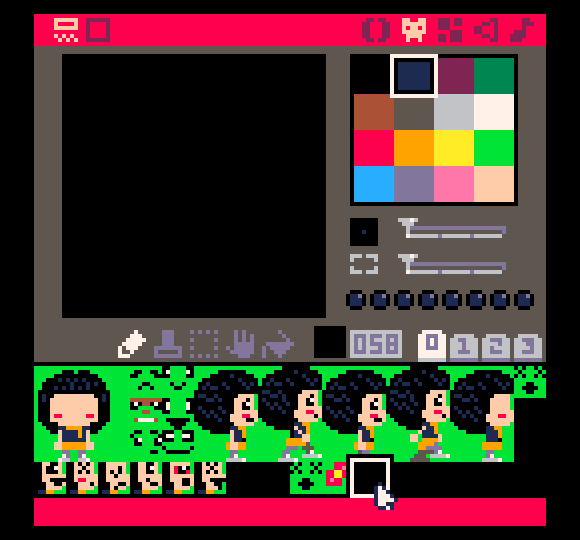 If you download the cart, you'll see that there are 2 sprites with blank faces, a lot of faces for front and profile view (demo only uses 1 face), and a ground tile set, and a flower accessory sprite, and a walking sprite which does have a face. The side profile sprite doesn't have arms. I thought perhaps arms animated using the line() function, with rectfill() for the hands to create arm animations. Demo is just some simple code I threw together to test the walk cycle out, and so it doesn't contain any kind of variables that create a parent/child relationship between the body and the face. Anyways, feel free to use these if you can use 'em. added missing image flip when turning left towards obstacles. Thanks to dw817 for pointing that out. Fixed slime behaviors. They no longer scale the walls when blocked in by the crate. Thanks to dw817 for pointing that bug out! Fixed problem where entering the pizzeria caused the player to lose alignment with game map. moved a dungeon key slightly so it's more visible. This game took about a month to make. It's similar to my last game, EGGHUNT, in terms of the layout and walking, but is much more complex as this game has enemy AI, weapons, and crate pushing. My first effort with the Pico-8. I hope you enjoy it. v1.1. I added Morning Toast's recommendation. So instead of saying "items found" or "secrets found" it says how many out of how many you've found. I also made a slight change to make ending "A" a little more obvious (but not by much) and optimized a little bit bit of the code. I'm glad everyone seems to be enjoying it. Thanks everyone! "Quack!"